The L.i 125 Special, S.X 150 and 200 which had been available, were all replaced by the new Bertone designed Lambretta G.P (D.L.) range. It was offered in three engine sizes, again 125, 150 and 200, which had many improvements over its forebears. This model for most markets was called the DL, but in the UK and some other markets the model was called the Gran Prix. 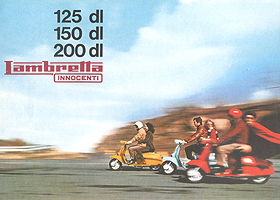 This was due to the fact that in the late 1960's Formula one racing was at its heyday in the UK with drivers such as Jackie Stewart were big news and Lambretta Concessionaires wanted to market the new model in a way to match its sporting looks. The newly designed body was shorter and sleeker, giving the GP/DL more sporting looks, slimmer leg shields, shorter horn casting, a rectangular headset and light unit was also used. Rear light was changed to a plastic item with ribs in it, forks, which were 1 inch shorter, wheels and hubs were all painted silver. The GP200 gained a disc brake and front dampers, again all painted in a Fiat 690 Silver. Black trims and rubbers we fitted a break away form the normal grey Innocenti had used before. The sleek side panels featured no badges or flashes, but instead wore black stripes, and small plastic grilles inset into an indentation in the side panels. All side panels for these models were now clip on, as the very last SX models. A trimmed and restyled front mudguard was fitted which all combined to give a sportier image for the new model. Ink splats (supposedly due to an argument when Bertone threw his pen down on the plans after an argument with Innocenti, over trim colours) were the main logo, except in the UK where chequered flags were used to go with its Gran Prix name. 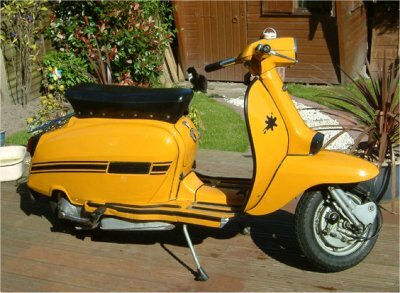 The rear frame badges from previous models was replaced by a grille, badging on the scooter was as follows: - Lambretta badge, then a cast either DL or Gran Prix badge dependant on the market with the engine is also on the same badge. A small Innocenti I logo was on the horn casting, and an Innocenti thin strip type badge was fitted on the rear of the frame. Engine wise the GP125 pretty much retained the engine form the Li 125 Special with a few small changes. A Dell'Orto 20mm carburettor was used, running through a new single piece carburettor to air box elbow rubber was used. Engine numbers were still stamped Li125S, but the GP gained its own number range. Again with the 150cc unit, this was again pretty much carried over from the tried and tested SX unit, and again retained the SX150 casing identity. Porting changes and a few other mods saw power rise to 9.4bhp. SH22/2 carburettors were fitted, again using the new carburettor air hose. 200cc models again carried the SX200 stamping, but as with all other GP models gained its own number range. A larger tapered crank and different flywheel was used on the 200 models, helping to cope with the extra power made from the engine modifications. The 200 gearbox shared the same ratios as the 125 models, but released the extra power by running 18/47 sprockets. The GP200 was capable of nearly 70mph according to the brochures, although not a lot more then the models it replaced, the main gain from the GP was acceleration. 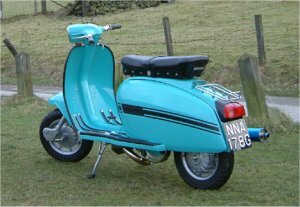 The 125 had colour options of white or turquoise, and was not really imported into the UK during its production as the laws at the time allowed learner riders to ride up to 250cc without passing a test, hence Lambretta concessonaires decided to stick to the 150 and 200 models. The 150 colour schemes were dependant on the market they were sold into as to the choice available. 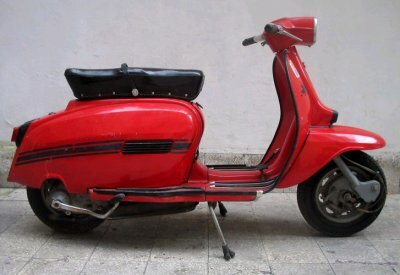 Italian home market models were availible in a single colour of white or red, whilst models destined for the export market could be chosen in a two tone option of white and then either red or blue for the side panels. A Lambretta concessionaires newsletter no (6/69) saw Lambretta UK list colour options as. All hawthorn white with black outlines, hawthorn white/ocean blue, orbit orange (yellow ochre), astral blue (turquoise). 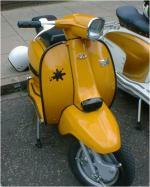 200cc models for the Italian home market were always Yellow Ochre, whilst export markets again gained more choice. 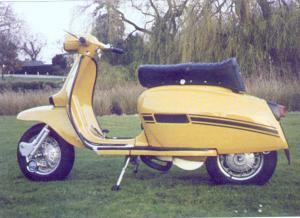 The news letter for Lambretta concessionaires listed martian red and luna dust (yellow ochre) as the only two options. Again as with almost all other models before, Innocenti made mid production alterations. To begin with early machines had painted horn and seat grilles, with the later black plastic. Metal petrol flaps and grey plastic toolboxes gave way to black plastic petrol flaps and toolboxes. Finally, it is often thought that it was the Indians who decided to use bolts, instead of studs and nuts to secure the chain case cover, but in fact the very last G.P's to roll of the production line were secured in this way. The final addition to the GP range was the GP200 Electronic, which came about from a collaboration between Innocenti and Ducati. This model as it names suggests gained an electronic ignition system. Gone was the traditional points and condensor that had been used by all other Lambrettas previous, being replace by a pick up box and CDI unit. The CDI unit was fitted to a small bracket and was red in colour, as was the HT lead coming from it! A new waffle style seat was fitted, this waffle type pattern was first seen on the Factory 200cc twin cylinder prototype scooter, but made it into production on the electronic. To further distinguish the new scooter, an electronic sticker replaced the ink splat / chequered flag on the leg shields. It is not known exactly how many electronics were made, as although they were made towards the end of the production of the GPs thought to be from around June 1970, standard points and condensor models and the electronics were made along side each other. Sadly in April of 1971, the last ever complete G.P rolled off the production line, with 15,300 125's, 20,048 150's (plus another 1,402 sold in kit form to other markets) and 9,350 200 being produced. The story does not end here though, as the Indian government brought all the tooling from Innocenti and produced the GP for many more years!